Nurseries Caravan Park is a family run site for touring caravans, tents and motorhomes close by to York, North Yorkshire. We are also known as Askham Lane Nurseries. The nurseries is part of a former plant nursery which specialised in growing English indigenous trees, some of which have been left to mature and now surround the site giving a relaxed and peaceful atmosphere. Our site is located in the open countryside just off the York A1237 outer ring road situated in private and landscaped grounds. We are ideally situated in a rural location just 3 miles from the historic York city centre and only 1 and a half miles from a Park & Ride bus service. Visits to the Yorkshire Dales, North York Moors and Coastal days out to Whitby, Scarborough and Filey are just a 1 hour drive away. In addition we are conveniently placed for trips to Castle Howard, Flamingo Land, The National Railway Museum and York’s Medieval Sites. Alternatively you can walk about a mile down the road to the pretty local village of Askham Bryan and visit the Nags Head Inn, where people of all ages can enjoy a great range of food and drinks in comfortable surroundings. 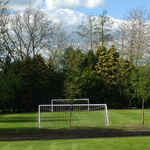 There are a range of facilities on site, including an open gamesfield with goalposts. We promote this site as environmentally friendly, and operate a system for recycling as much as possible. This is a dog friendly caravan park but please keep your pets on a lead at all times. Escape to one of our luxury glamping suites nestled amongst the trees. 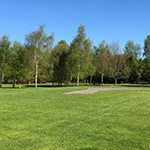 Relax in the peace and tranquility of our caravan and camping field set amongst 7 acres of landscaped private grounds. The historic city of York is just short of 3 miles from our park entrance, with the North York Moors and the coastal towns of Scarborough, Bridlington, Whitby, Robin Hoods Bay and Filey within easy reach. 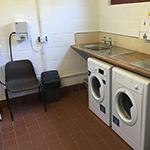 If you are looking for a caravan park in North Yorkshire in an ideal location, please do not hesitate to get in touch with us directly, you can call on 01904 797427, email us at enquiries@nurseriescaravanpark.com or just contact us directly by pressing the button below, alternatively continue to browse our website for more information.